When writing historical novels I try to read books or news articles that were actually published at the time - to get a feel for the structure of language; and also the usage of the slang. 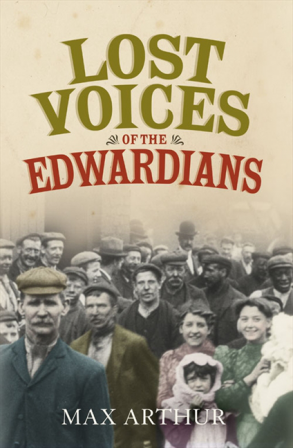 But something I found so interesting when creating The Last Days of Leda Grey was a book called Lost Voices of the Edwardians compiled by Max Arthur ~ which is simply made up of reflections from those who had actually lived at the time. Assembled from public and private archives - from people involved in various trades, from those who resided in country or town, whether children or adults, rich or poor - this is an extraordinary read which brings the era to vivid life. From school I put in for a thrift form. I was given a corduroy suit and a pair of boots, and I cam home so proud of that suit. But when my father came home in the evening and saw it, he asked 'Where d'you get that from?" 'From school,' I said. "I signed the thrift form.' 'You can take it back.' Charity he wouldn't have. We had literally nothing to eat, but charity he wouldn't have. I left school when I turned fourteen. 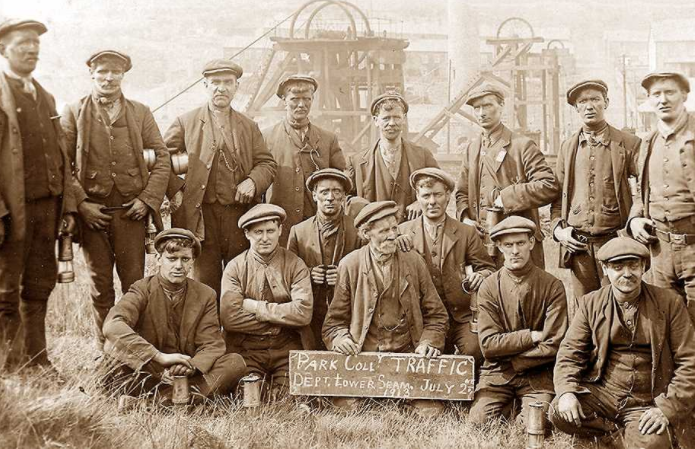 I left at teatime, had a drink of tea with my dad, walked up to Seaham Colliery, signed on and started work the next morning. I was down the pit at ten minutes to five on the day after I finished school. An unwelcome task the police had in those days was administering the birch to young offenders. My father who was a policeman, used to say how difficult it was to punish a bloke that he'd never seen before. You could get half a sheep's head in those days. There as a stall in Brick Lane. My mother used to buy them. They used to be very nice cold. Every poor person used to buy them, and tripe and all that kind of thing. On Sunday you used to get the muffin man round. Muffins and crumpets. He had a huge tray on his head and it was always covered with green baize. He'd ring a bell, about four o'clock in the afternoon. If you wanted crumpets you'd just go out and buy them. And there was a winkle man who used to come round, and a man who came round with fish. He had a barrow with a couple of boxes of fish on it. He put out plaice, perhaps a dozen small dabs, a half dozen small haddocks - threepence the lot! On Saturday afternoons we'd go to the Palace Cinema - a penny to go in and it was all silent movies with someone playing the piano - oh yes, they were good. They'd be playing while us kids were creating hell. Then we'd buy a bag of sweets when we came out. 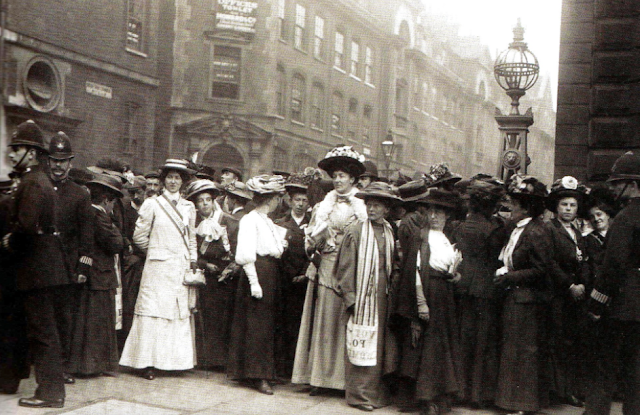 There used to be political meetings in Shoreditch near St John's Road. I went to listen to Horatio Bottomley. He used to give a hundred weight of coal to the poor people of the area. My family got coal from him and they used to vote for him for that reason. I saw him. He was a big fat man, always well dressed. He was a very nice chap. My first imprisonment was in Preston in 1909. I went on hunger strike but unfortunately, my fine was paid by my mother at the end of the week. Before making his name in the world of film, GA Smith had already been involved in the visual entertainment trade. 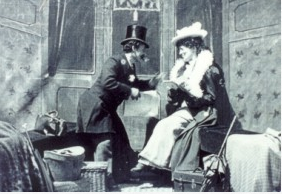 He performed as a stage hypnotist, a psychic, and a magic lantern lecturer. 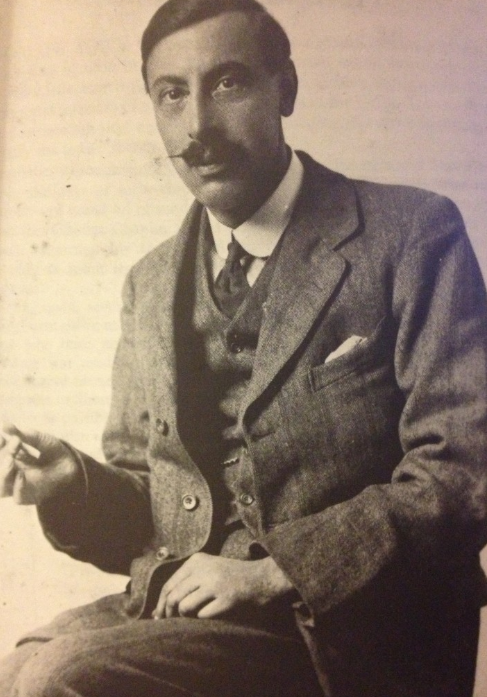 But his films are what he is remembered for best, particularly the technical expertise that led to him developing successful colourised moving films: a method called Kinemacolour. Following the death of his father, George went to live in Brighton where his mother ran a boarding house. It was there ~ often in the Aquarium ~ that his stage illusionist act began. 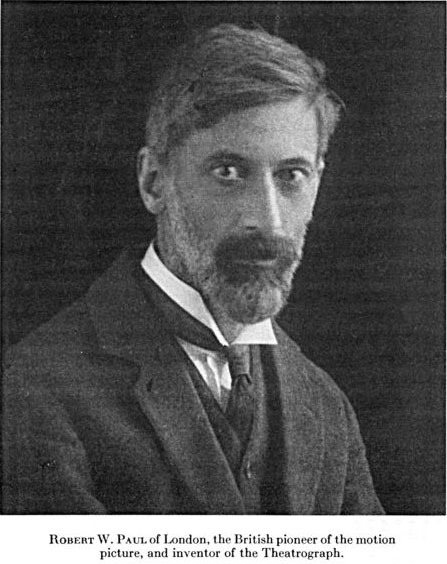 And perhaps his skill at deceiving the eye was what led Edmund Gurney, Honorary Secretary of the Society for Psychical Research, to be entirely convinced that Smith was a genuine spiritualist and to employ him as his secretary. But, when accused of being a fraud Smith left the SPR in 1892 and leased St Anne's Well Gardens in Hove. 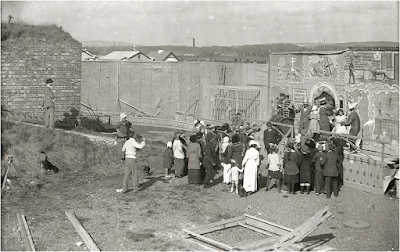 There, he then went on to develop the park as a popular seaside pleasure resort, gleefully described by the local press as: 'This delightful retreat ... presided over by the genial Mr G. Albert Smith, is now open ... In the hot weather the refreshing foliage of the wooded retreat is simply perfect, while one can enjoy a cup of Pekoe in the shade'. The gardens were indeed elaborate, with hot air balloons, and parachute displays, a monkey house, a fortune teller, and a hermit living in a cave - not to mention the magic lantern shows which used clever scenery and lights to create dissolving picture shows which were advertised at the time as :"High Class Lecture Entertainments with Magnificent Lime-Light Scenery and Beautiful Dioramic Effects." Many skills learned for this craft went on to be used when editing moving films - the interest that obsessed Smith after seeing the films of Robert Paul, after which he also joined forces with others in the local Brighton film industry - as well as securing a friendship with the French director, Georges Melies. By 1889, having acquired his first moving film camera from the Brighton-based engineer Alfred Darling, and with chemicals bought from James Williamson, a Hove chemist and fellow film pioneer, Smith erected a purpose-built glass house in the grounds of St Anne's Gardens, specifically for making films. Films such as The Kiss in the Tunnel, The Sick Kitten, The House that Jack Built, Grandma's Reading Glass, and As Seen Through a Telescope. Many of his short comedy films (usually no more than a minute in length) starred the local comedian Tom Green, as well as Mr Smith himself, and his wife, Laura Bayley ~ with Laura being an actress who'd worked before in stage pantomimes and also in comic revue shows. However, by 1904 Smith left St Ann's Well Gardens and moved to Southwick in Sussex - the house he called Laboratory Lodge, which is where he was to concentrate on developing his colour film. 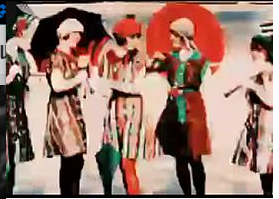 Films that illustrated this are Woman Draped in Patterned Handkerchiefs, and A Visit to the Seaside - both created in 1908 and resulting in Smith being awarded a Silver Medal by the Royal Society of Arts. More colour films were made until Smith and his long time partner/financier, Charles Urban were put out of business following a patent suit filed by William Friese-Green. This effectively ended Smith's career - after which he was sometimes said to be seen out on the Brighton seafront peering through his telescope - by then becoming a fellow of the Royal Astronomical Society. However, he was not entirely forgotten in the world of film. In the late 1940's, and well before his death, G A Smith was given the honour of being made a fellow of the British Film Academy. And today you can learn more about his work by visiting the Hove Museum where there is a permanent display dedicated to his genius. 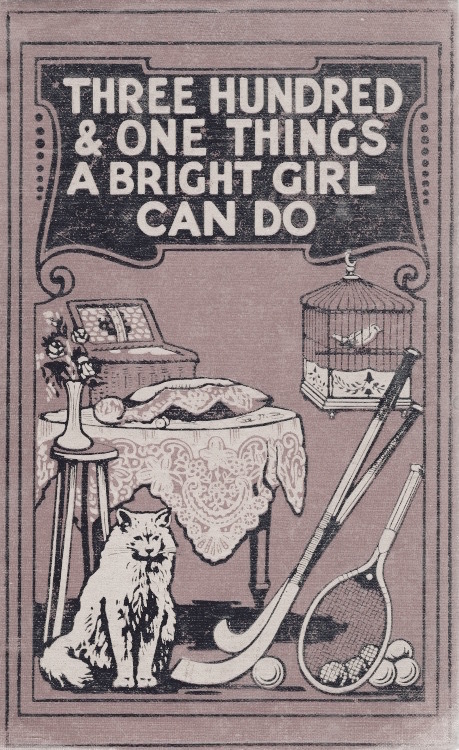 When researching The Last Days of Leda Grey, I took enormous pleasure in reading a book that was published during the Edwardian era: Three Hundred And One Things A Bright Girl Can Do. I have to say that I would have loved to own such a book when I was a girl. It’s quaint, and in some ways it lingers in the realms of the nineteenth century. 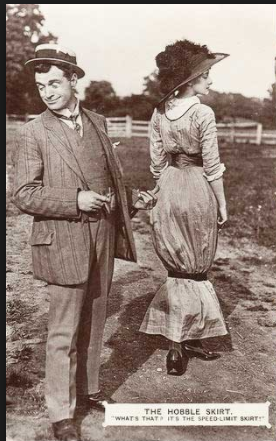 And then, there is the fact that only wealthy young ladies would have had the time or the means by which to truly apply themselves to its activities. But, it’s also exciting in its intention of offering independent thought, not to say to advise on certain tasks that are brave and somewhat reckless, even in our more liberated days. There is no need to become “mannish”, for girls have a world of their own, and qualities of their own, and a happy, healthy schoolgirl has surely no need to wish to be anything else, or to seek to imitate anyone else. All she need do is be herself. A girl may be able to swim, and yet she may not be a sufficiently strong swimmer, nor a sufficiently daring swimmer, to go out of her depth. Shall she, therefore, abstain from swimming? Certainly not. She still has the exercise of swimming, the fresh air, the sunshine, the exhilaration, the tonic effect of salt or fresh water, and, indeed, it may be that she receives all the advantages that are enjoyed by the strong swimmer who pushes far out to sea. Push on, young women. Push on! Swim and splash, or play hockey, or badminton. And even if such outdoor pursuits are not what takes your fancy, there are pages on knitting, and sewing, or sketching ~ and samples of music for you to play upon the house piano. There are lectures on architectural styles, on lace making, and pet keeping. There are recipes for drinks and meals. And for those with more daring imaginations, there are a host of ‘magic’ tricks to create mystification among your friends. There are even some tutorials that explain how to make garden hammocks, to read futures in palms, or tell fortunes. Not forgetting the fabulous parlour games with names like Wizard’s Writing. And then there are the plays to produce ~ with much reference to Louisa May Allcott and the lengths that her Little Women went to when producing their fictional shows at home. A play, here called Norna, or The Witch’s Curse, is offered for our Bright Girls to act in - with pages and pages of scripted text, followed up by instructions for make-up and costume, or the way to create a drop curtain, such as those you would find on a real stage. 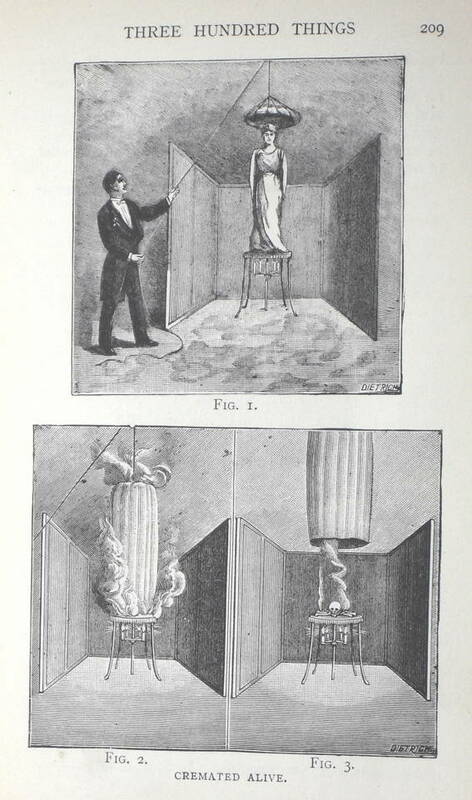 Even the lighting is discussed with details of all the chemicals to purchase for different coloured flames, which must have been quite a fire risk ~ and which brings me on to the main event that I used in the pages of my book. The spectacle known as Cremated Alive. On the evening before our ‘Cremated Alive! A Dramatic and Fiery Spectacular’, I spent hours on my costume. 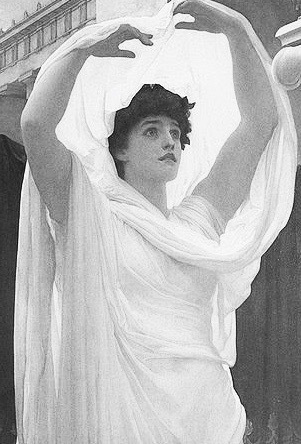 It was one of the vestal virgin robes from the fancy dress racks in the shop, to which I’d added pins and chains found in our mother’s jewellery box. During these preparations my brother was in the drawing room, arranging the window’s large box bay into a sort of a private stage, just as the book suggested. With the window’s shutters being closed so as not to be seen from the street outside, he’d erected a wooden table that was customised with mirrors, along with the sack in which I’d hide when I ducked behind the furniture, with a bell that I would jangle, and the most convincing charred black skull that he’d made from papier mâché . . . just waiting there to be revealed when I vanished in a puff of smoke. When we came to perform the thing itself, Rex ~ with the ringing of the bell and the sudden flaring of the flames ~ could only be subdued again when we put him in the garden, along with any scraps of meat left over from our leg of lamb. He’d barked, and Mrs C (who’d also stayed with us for lunch that day) had screamed, becoming very red, with a creaking of her corset bones when leaping from her seat to grab a vase of flowers on a stand, and about to fling its contents out to douse the conflagration, before Ivor had the common sense to make her sit back down again. But how delighted I had been to think she’d really been convinced, even if that wild reaction might have been enhanced by Ivor’s wine, whereas Theo and I had been reserved, only sipping a little over lunch to be sure of our wits while we performed. But to hear our audience applaud! And then, when Ivor said that if we did a turn at the theatre Royal we’d be sure of a standing ovation ~ well, I’m sure his tongue was in his cheek, but still, I felt so happy. I felt not the least cremated. I felt as if I’d walked through fire and found a new me on the other side. I felt a humming in my blood, as exultant as I’d ever been when I’d dared to dream of a future life as an actress in the moving films. © Essie Fox. The Last Days of Leda Grey. Published by Orion, November 3 2016. 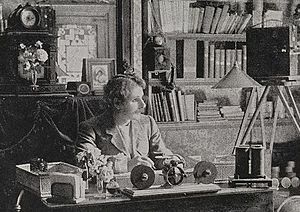 R W Paul was an inventor of intricate electrical instruments, such as the unipivot galvanometer, and wireless telegraphy sets which were often used in submarines during the years of World War 1. From 1918 when his business merged with the Cambridge Instrument Company he helped to invent the iron lung. But his pioneering expertise in the era of early silent film led to great innovations there as well ~ even being able to put one over Thomas Edison when discovering that the American had not patented his new kinetoscope (the forerunner of the motion film projector, where films were observed through a large box, inside of which reels of films were hung). 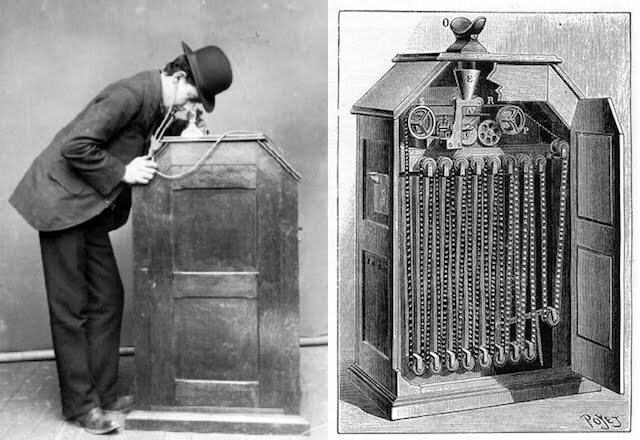 Having dismantled Edison’s machine, Paul then constructed one of his own, although when it came to showing films only bootlegs could be used, with Edison being canny enough to patent the cameras that made the films. So, along with a man called Birt Acres, a photographic expert, Paul designed a camera of his own. 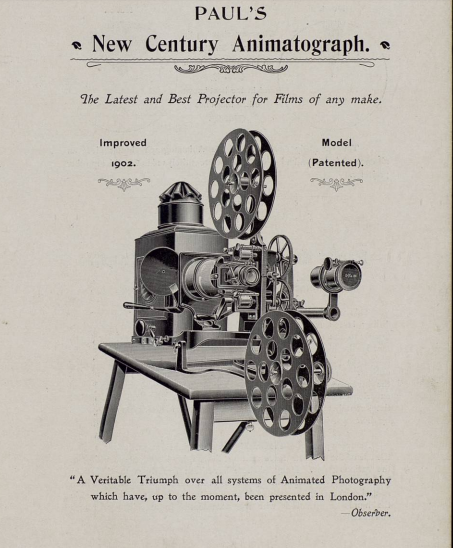 Also, by then having had success at the Earls Court Exhibition, they considered projecting the films they made onto much larger theatre screens ~ something else Edison hadn’t thought about. At this point the Birt partnership ended. 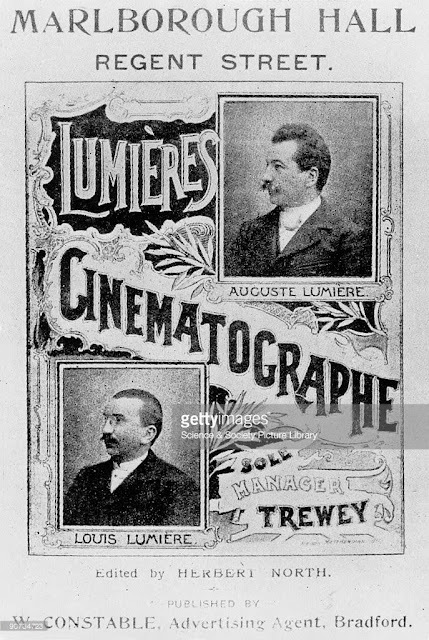 The two men became competitors, both demonstrating their machines in the early months of 1896 ~ with Paul’s new show coinciding exactly to the day with that of the Lumiere brothers first appearing in London with their shows. What an exciting time it was for the future of the film industry! 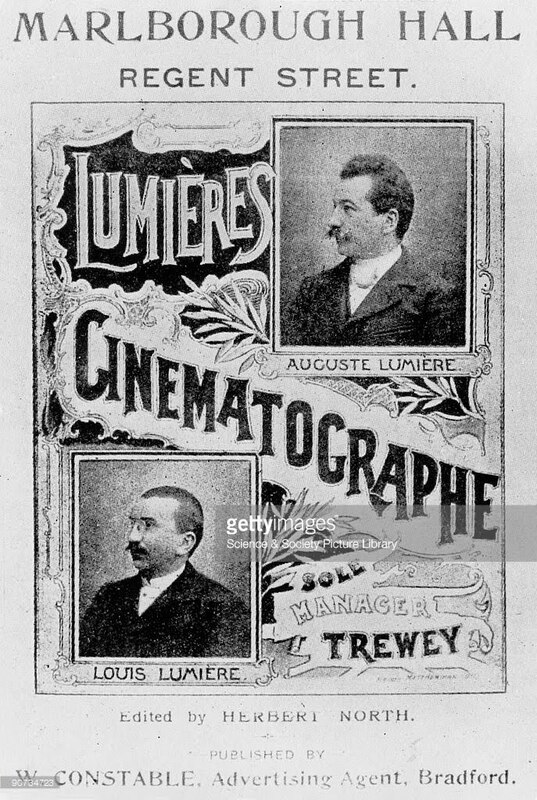 In very little at time at all the Lumieres were on permanent hire at the London Empire Music Hall, while Paul was employed in Leicester Square by the Alhambra theatre. With these ‘Theatrograph’ shows then becoming successful all over the country, Paul extended the rest of his empire to create a larger business. He produced cameras and projectors, and everything that might be used to set up a cinema of one’s own. 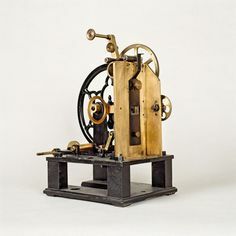 In short he had the foresight to see where the industry might lead, and the business sense to take control of every aspect of manufacture, rather than being one small cog if what would be the most enormous wheel. Still working on innovations he created hand-held cameras to be used anywhere a director wished, thus extending the scope for film-making to include more natural scenery. The introduction of reverse cranking meant that the film run through the cameras could be moved backwards as well as ahead, thus creating double exposures ~ a technique of huge importance when creating special effects for films. 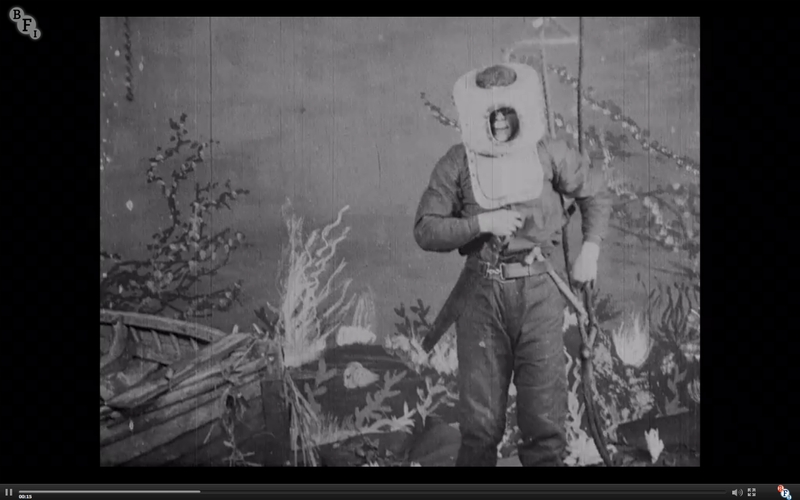 We now call these early film techniques magic, or trick illusions, such as those in the films of Georges Méliès, the genius French director ~ whose first cameras were bought from R W Paul. But, Paul was also a film maker. 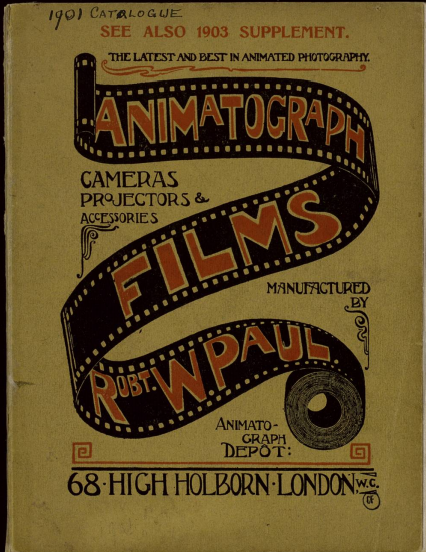 In 1899 he set up his own studio in London's Muswell Hill, creating over 1,000 films. He travelled through Europe to capture natural scenes, and even reproduced battles from the ongoing Boer War ~ which were reconstructed in London when he couldn't film in Africa. 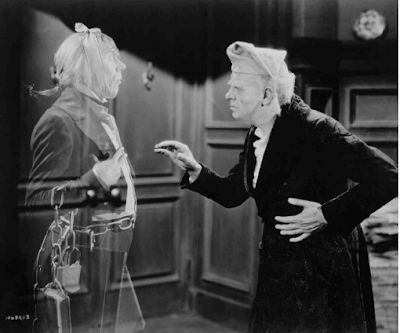 In 1901 he created Scrooge (also known as Marley’s Ghost) ~ which was something quite incredible, even though the double exposure trick had been used for years in photography, particularly by those charlatans who claimed to take pictures of the dead as they hovered around the living who posed for pictures while they grieved. Paul’s gift for cinematography may look crude to our modern eye, but it's clear to see in the still below how this imagery was later used in 1936, in the film of A Christmas Carol, starring Reginald Owen as Scrooge. R W Paul created special effects that we tend to take for granted now - such as the use of close ups, or the cutting from one scene to another. 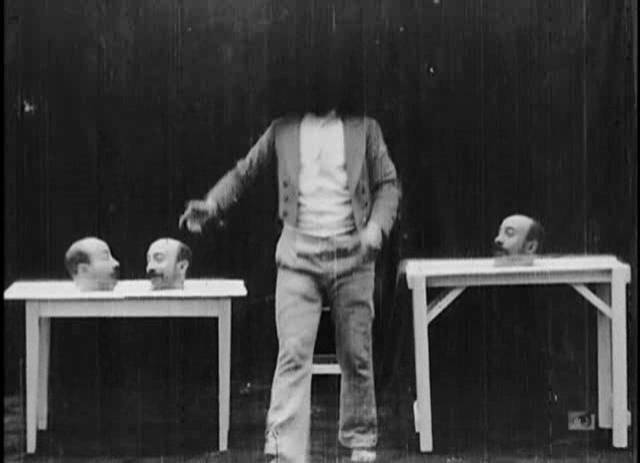 However, for all his talents, by 1910 he had left the movie industry, destroying all his negatives and concentrating instead on the other areas of his growing business empire. Perhaps he'd been disillusioned by all the financial restrictions in an expanding global industry, with various cartels set up to try and control the trading terms. The loss of so many films is hard. Only a small number have been preserved. What archives we might well have had! But such was the influence Paul made that, to this day, he is still known as ‘Daddy Paul’ by many of those employed in the world of moving film. 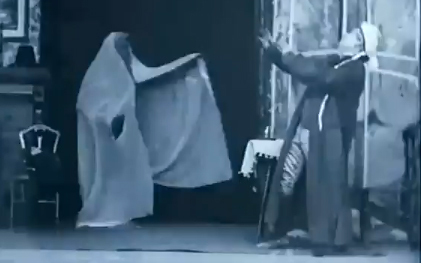 And, in tribute now I will leave you with the final film that Paul produced, which is called Is Spiritualism a Fraud? 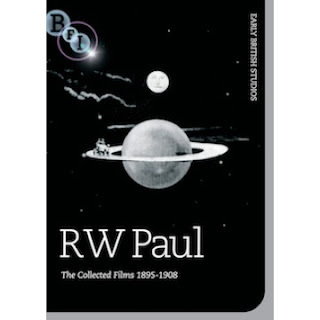 The BFI have produced a DVD compilation of the surviving films by R W Paul. The box also includes a really good pamphlet with detailed information on every film it features. 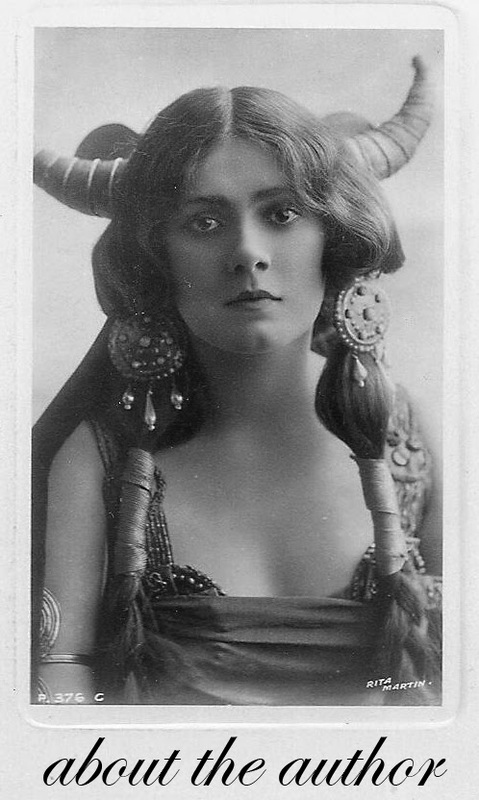 When writing The Last Days of Leda Grey, my novel about an Edwardian actress who plays a part in silent films, I was very much inspired by the oriental and vampish style of many theatrical femme fatales in this era that led to the First World War. But what could be more sensational than the appearance and life of the dancer who was known as Mata Hari: the true life story that is told in The Red Dancer, by Richard Skinner? 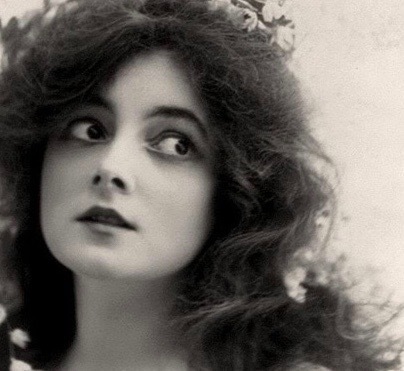 The Red Dancer opens in 1895 when, as a young woman in Amsterdam, Margaretha Zelle answers a lonely-hearts advertisement placed by a soldier twice her age in a local newspaper. But her marriage to Captain McLeod of the Dutch army ends in tragedy and acrimony and she leaves their posting in Indonesia. Heading for Paris, she adopts the stage name Mata Hari ~ 'Eye of the Morning' ~ and reinvents herself as an exotic dancer. 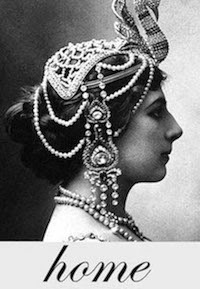 Mata Hari's fame soon spreads throughout the cabarets and theatres of Europe and, as the major powers lurch towards inevitable conflict, she begins to attract the attention of numerous admirers ~ many of whom are officers, all too keen to share their secrets with a woman of notorious intrigue and allure. Set against the dramatically imagined backdrop of pre-War Europe, Richard Skinner's novel weaves interlinking chapters of fiction and non-fiction to conjure up the life, the loves, and also the tragic destiny of a woman who continues to fascinate almost a century on from her death. The above description is taken from the Faber & Faber website. Who can have seen the photographic images of the exotic dancer, Mata Hari, and not have been intrigued to know more about this glamorous woman ~ even more so to understand how she could have been drawn so easily into webs of spying conspiracies leading into the years of the First World War: the crimes for which she was then tried and sentenced to death by a firing squad? For a fascinating insight peeling back the layers of lies and intrigue I found myself glued to every word of Richard Skinner's The Red Dancer. The structure of the novel is original and quite unique, offering different viewpoints from the voices of those who, to greater or lesser extents, came to know the alluring dancer. Between such first-hand narratives, and ultimately a transcript of the arrest and interrogation that took place in London's Scotland Yard, we also read small chapter 'essays' that illustrate the politics, the art, and the general atmosphere of the Europe in which she rose to fame, and which so influenced her fate. From the time when I took my first uncertain steps I was shut up in the great subterranean hall of the pagoda of Siva, where I was to be trained to follow in my mother's footsteps through the holy rites of the dance. Of these early years my mind retains only vague recollections of a monotonous existence in which, during the long morning hours, I was taught to imitate automatically the movements of the bayaderes, and in the afternoons was allowed to walk in the gardens while weaving garlands of jasmine for decorating the altars. And so, the spell was woven around Margaretha ~ also known as Gerda ~ whose Dutch father abandoned the child who then suffered her own unhappy marriage which was full of betrayals on both sides, and during which a small son would die and a daughter would be stolen by a gambling, violent husband. 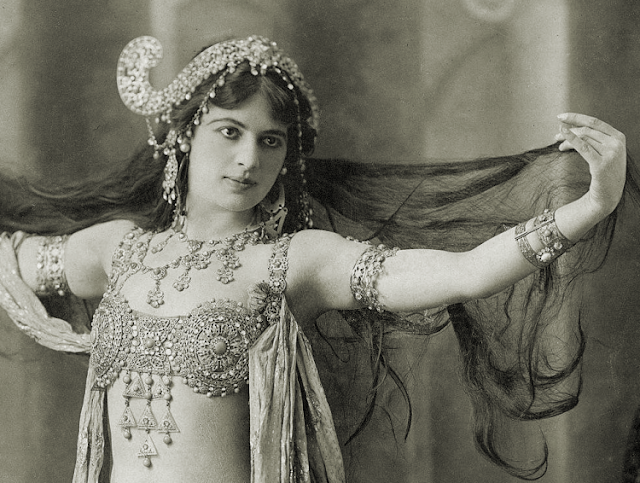 Left alone and penniless, with only her beauty and wits to survive on, Gerda becomes Mata Hari, the performer and the courtesan who trades her flesh for the secrets of prominent men in the military. As Europe heads towards a war the seductress is all too rapidly lost in a spiralling slide to disaster (beautifully foreshadowed in the description of a skiing accident in which she almost meets her death) through brave though misguided illicit affairs. This is quite a story. Refreshingly original and utterly captivating in style. With the glamour, thrills and mysteries of this roller coaster of a life, in some hands it might perhaps have led to melodramatic fantasies. But Richard Skinner's stylistic pen is very cleverly restrained. A calm rendition of the facts allows the raw emotions felt for such a doomed and tragic 'heroine' to strike home with a reality that is immensely powerful. 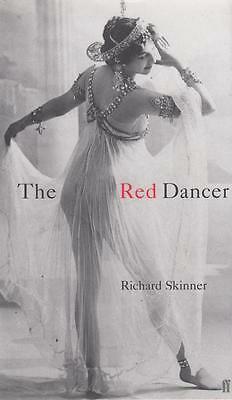 The Red Dancer (the original cover of which is shown in the body of the article above) was first published by Faber in 2001. Now, it will be repackaged and re-issued in October 2017 to commemorate 100 years since Mata Hari's violent end. 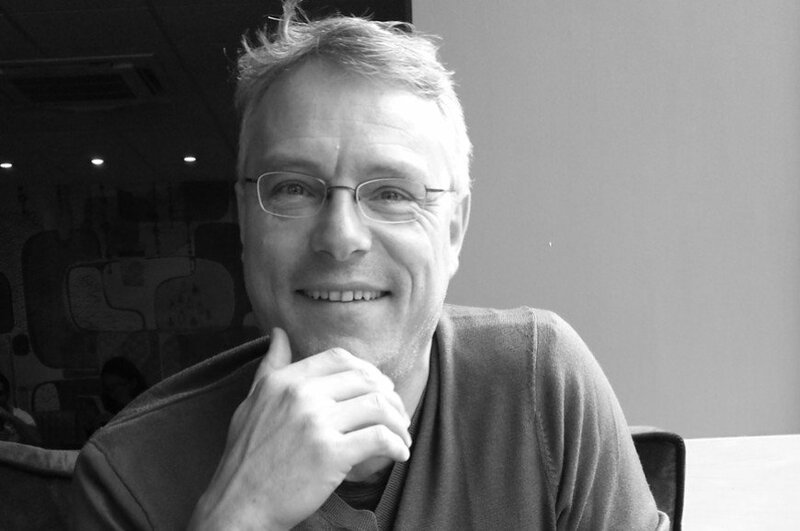 Richard Skinner is the author of The Red Dancer, which was translated into seven languages. He has also published a collection of poetry, the light user scheme, and a writer's handbook, Fiction Writing. A translation of The Velvet Gentleman was shortlisted in France for the Prix Livres & Musiques. He is Director of the Fiction Programme at Faber Academy. It was quite a surprise for me to discover that. 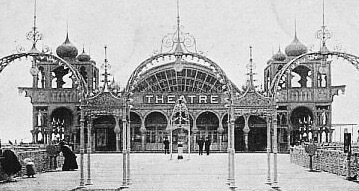 from the earliest years of the last century, Brighton and Hove in Sussex had its very own thriving film industry, as shown in this wonderful source, Brighton and Hove, Film and Cinema. Not only were films made in the town, but in the countryside around, particularly at Shoreham. 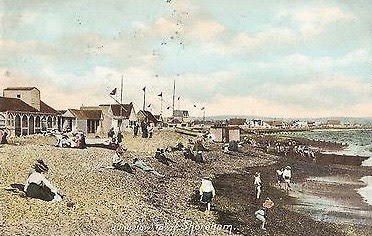 The history of Shoreham's film industry dates back to 1900 when an actress called Marie Loftus (the Sarah Bernhardt of the music halls) decided to visit the beach while working a stint in Brighton. There she found an old stone fort built during the Napoleonic wars, and also some shoreline fisherman’s huts. 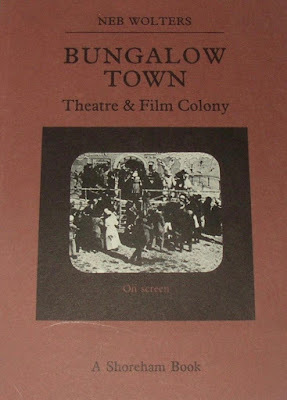 Finding the setting appealing, she decided to have her own bungalow built, after which she was joined by many friends of similar theatrical bents. A small colony was soon to grow. What has since been called Bungalow Town was formed of basic wooden frames built around old railway cars, with the wheels removed so that they could then be set on timber and concrete foundations. Not until after the 1920s was piped water, gas, or electricity available for the bungalows. Those who had lived there previously must have felt as if they’d stepped back in time, relying on candles and paraffin lamps to see when the sun went down at night, collecting fresh water in pails from containers, cooking their meals over camp fires, and using soil cesspits instead of flushing lavatories. A few homes did have generators installed, but most of the Bungalow home owners who spent much of the year travelling with work seemed to like the natural way of things; as well as the community spirit that came along with a Bohemian lifestyle ~ roughing it down by the sea whilst still having the option of commuting back up to London on the efficient railways. As well as appealing to theatrical types, the light at Shoreham also drew many artists and photographers who liked to work along the coast. With miles of sea on the one side and the rolling Sussex downs above, the air was unusually free of fog and other pollutants found in towns. This sparkling and luminous quality proved to be an important factor when photographers evolved into film makers who eventually formed a small studio, using the old harbour fort as the stage upon which their movies could be made. 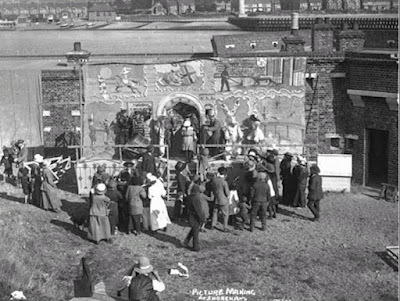 Storage rooms were built around, and the walls were hung with canvasses to show the painted scenery. But, of course, this was not perfect. You couldn’t film in wind or rain without the sets becoming wet or wobbling uncontrollably. All sorts of people turned up for him. Fishermen. Farmers. Holiday folk. And, after performing as extras for free they’d often pay to go and see themselves on a screen when the films were made: films such as The Showman’s Dream, Whitewashing the Ceiling, or Some Fun. Much filming was done in the summer months when the daylight hours were longest. The shorter darker winter days were used for creating the title cards, and for editing the special effects, as well as doing the admin for preparing to show at trade fairs. The introduction of electric lights, powered by oil-fueled generators, could extend the weeks of acting work - although not without the risk of fire. And such a fire did occur after Lyndhurst's original studio had been sold in 1918 to Sidney Morgan and his Progress Film Company. The Shoreham film business was expanding, with a preview theatre, construction sheds, stores where equipment and costumes were kept, and even accommodation for the actors and staff brought in for the work. But then, in 1922, a terrible blaze broke out one night, destroying most of the premises. It was only due to the awareness of the cameramen, Stanley Mumford, that many films were saved, when, along with his brother, Arthur, he dragged out the boxes kept under their beds in which reels of negatives were kept. After that, he had the presence of mind to set up his camera and film the inferno, recording how many buildings were lost though the main glass studio survived, with only some cracks in the panes of glass of which the structure had been made. So ended the Progress business in Shoreham... though some others continued to make films there before the glass house was later converted for light industry and storage, Today, it is used as a children’s home, but most of town around is lost ~ demolished during the second world war when the army needed a clearer run for preventing invasion from the sea. Such an invasion never came. A unique community had been lost. 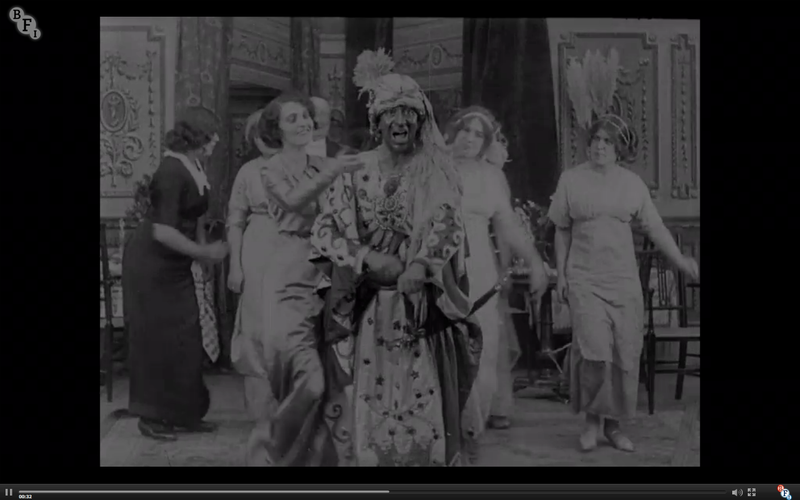 But we have the proof of its legacy in those silent films that still remain. For more fascinating details and photographs relating to the history of Bungalow Town, please see Neb Wolter's invaluable book: Bungalow Town: Theatre and Film Colony. 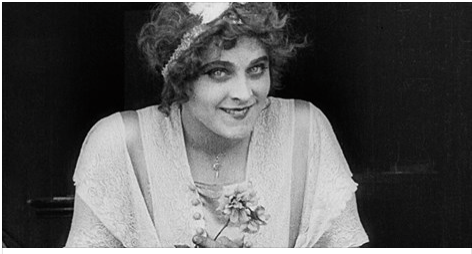 The British Film Industry Archives has digitised many old silent films, a great number of which can be viewed for free on the BFI iplayer site. 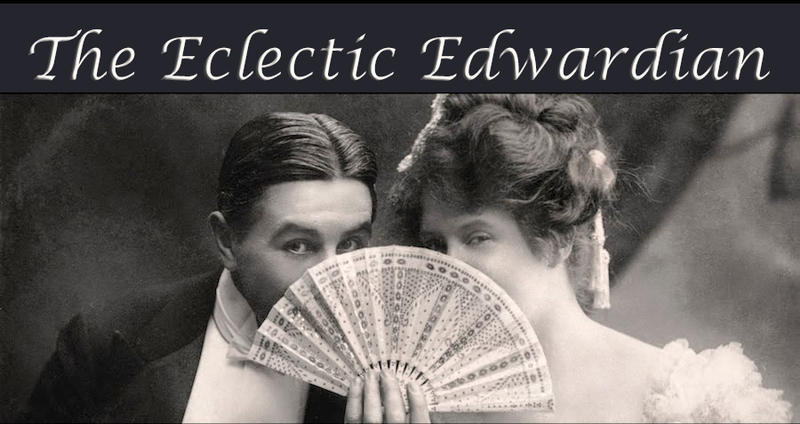 They also sell films on DVD, and some are released for theatre screens ~ such as A Night at the Cinema, which I was lucky enough to see when first starting to write a novel that is set in the world of Edwardian films. Such nights would often be made up of compilations of footage from several stand-alone short films, with a selection of different genres. Comedies, dramas, and travelogues, and also newsreels of war zones. I viewed the films in Richmond upon Thames, at a small independent cinema. But, had I been around to go along when they were first released I might have seen them anywhere ~ in a brand new film theatre, or at the end of a seaside pier. There might be a screen set up in a shop, or in a church's social hall. And although the films were silent, the venue certainly wouldn't be, with music being a vital part of the moving picture industry. A solo piano or organ, or an entire orchestra might create the films' accompaniments ~ with different styles of melody to enhance the action or the mood. I recreated such an evening in my novel, The Last Days of Leda Grey. The following is an extract; a scene when the young Leda Grey, who has great aspirations to act on screen, goes along to the local seaside pier to see a showing of some films made in the local area. Those films are known as 'actuals', which means they don't have any actors as such, but exhibit natural settings with everyday people walking about ~ anyone who happened to be around when the director shot his film. 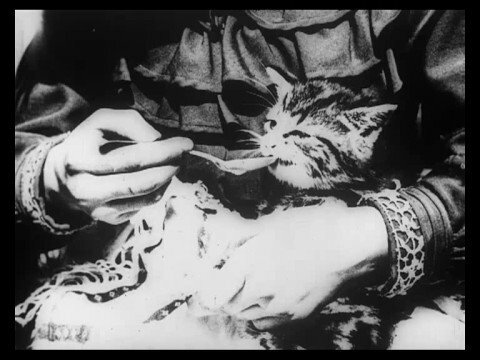 It's in one of these moving picture shows that Leda has a starring role, and because of that she can hardly contain her joy when she goes to see the film. I felt such panic rise inside when I also read that menu card, where every feature mentioned was to be an actual of the town, with titles like A Cliff Top Walk, or A Visit to the Aquarium. But Theo was right. There was no sign of any Brightland Promenade. 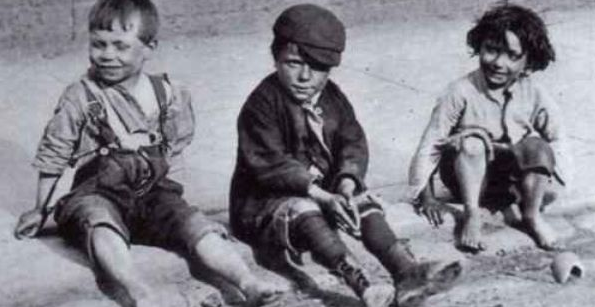 Taking my brother’s hand in mine, I squeezed it hard, and harder still as every moving film was played, and even though each one was short, two or three minutes at the most, for me they seemed to last an age. The lantern’s rattle was too loud. The piano’s notes were jangling. The sneezes, and the hacking coughs. The peanut shells that two old ladies crunched and cracked in seats behind. All that noise! My fraying nerves. I couldn’t begin to enjoy the show ~ until the last film flickered up. The slightest judder of the frame, and then four curling corner scrolls around the fancy title script: A VIEW OF BRIGHTLAND PROMENADE! ‘Oh, Papa? Was I really?’ It had all been over in a flash. I only wished the frames could roll right back and then run through again, for people in the seats around to look at me and realise that I had been the girl in white whose face filled up the final frames. But would they know me anyway? They’d see a girl who’d spent all afternoon in brushing out her hair, a hundred times to make it shine, and nothing like the frizzy mess when she’d been on the promenade. They wouldn’t see the waif and stray dressed in her shabby muslin dress for, very much to my dismay, Mrs C had gone and laundered it. It was dripping on the garden line, and I’d been forced to wear my green. The one she liked to see me in, always saying it suited my colouring. But what an irony it was that, whereas my white was much too large, the green had shrunk when in the wash. The hems too short, the bodice tight … so tight that I could barely breathe when the final curtain fell again, when we sat there waiting patiently for the director to appear, to bow and give a little speech, as was the usual way of things. But no. There was no sign at all of the man who, just the day before, had stood behind his camera in the back of the open horse-drawn cab. The theatre’s lights blazed up to leave me standing in a giddy daze while we shuffled through the narrow aisle that led towards the exit doors ... though before we left the foyer to walk back down the pier again, Papa approached the manager (that gentleman well known to him through shared professional ventures, with my father photographing acts for the hall’s publicity and such), and said, after some other chat, ‘If you happen to see Monsieur Beauvois ... the chap who made these actuals ... won’t you tell him I would be so pleased if he’d visit my studio in the Lanes … or if he’d like to come along and dine in Brunswick Crescent. I would also be obliged if you could ask if there might be a chance for me to purchase a copy of the final film. The one called Brightland Promenade.’"
Extract from an unapproved proof copy of The Last Days of Leda Grey. 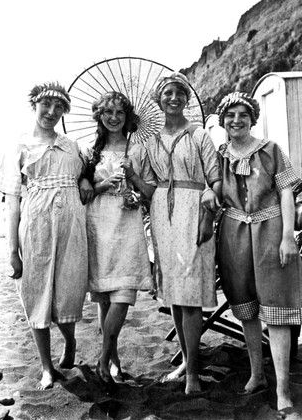 EDWARDIANS AT THE SEASIDE ...BEHAVING BADLY?